Upon arrival in Kashgar, your local guide will meet you at the airport and transfer you to check in your hotel. Overnight in Kashgar. Kashgar is a fabled city embracing a rich mix of peoples and cultures, with Mosques and veiled women contributing to its Middle Eastern atmosphere. 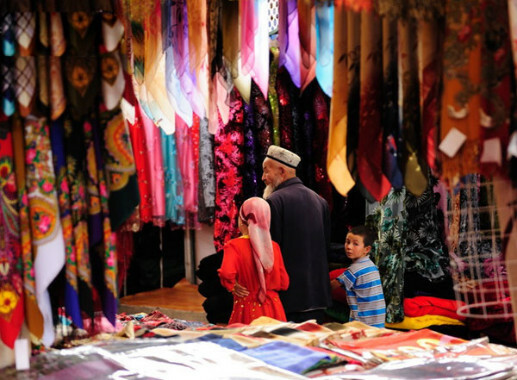 No visitors to Kashgar should miss the Sunday bazaar. In the teeming market, you can buy anything from herbal medicines to carpets, from a cradle to a camel. In the afternoon, visit the town center the vast Id Kah Mosque. afterwards, you visit the a school and a workshop where traditional carpets are made. You also tour in a donkey cart taxi the Old Town, a warren of twisting alleys and white-washed walls, and the Tomb of Abakh Khoja(also called Fragrant Concubine tomb). Then you will take an evening flight or overnight train with soft sleeper to Urumqi. After pay a morning visit to Erdaoqiao International Grand Bazaar, you will take a excursion to Tianshan Mountains, to visit the beautiful mountain lake-the Heavenly Lake and Mt.Bogoda Shan(5445m in altitude). it is snow-capped all year around. In the afternoon you will be transferred to Nanshan Grassland for a visit to the Terai Camp to experience of Kazak nomad life, have a cup of milk tea and taste really local food. A morning drive to visit Grape Valley, the oasis town of Turpan famous for its melons and vineyards. Here Marco Polo first encountered spaghetti, an idea he took home to Italy. In the late afternoon, you winder through the streets of ruined city Jiaohe, inspect the 2000 year old Karez Wells, a remarkable underground irrigation system. Underground Tomb. In the afternoon, we will explore Emin Minaret, one of the finest buildings on the Silk Road. we will walk through the amazing village street . Take an overnight train to the City of Dunhuang via Liuyuan. Arrive in Liuyuan at 07:51. You will be transfer to Dunhuang city (3hour driving). As an important caravan stop on the Silk Road, Dunhuang is renowned as the site of the greatest trove of Buddhist art the world has known - the Mogao Grottoes which date back to AD366 - and today you will visit these fascinating caves. Then you will proceed to visit the Mingsha Dunes "Singing Sand" - where you can make a (steep) climb up the massive sand dunes for a great view of Crescent Moon Lake. You will enjoy camel ride, sand surf and sand bath today. Overnight in Dunhuang. After hotel breakfast, you will be transferred to the train station to catch the train to Jiayuguan. Upon arrival, you will explore the town of Jiayuguan and visit the Great Wall Museum. Then view the "underground gallery" in tombs from the Wei and Jin periods AD220-240. And then visit the Jiayu Fort, known as the "Impregnable Pass Under Heaven". After hotel breakfast, you will be transferred to Zhangye for 3 hours' drive. On arrival, you will visit the Grand Buddha, Wooden Pagoda Temple, Zhangye Danxia colorful mountains. Take an overnight train with soft sleeper to Lanzhou. Visit to the Gansu Provincial Museum, White Pagoda Hill. Then travel by coach to Xiahe via Ningxia Hui Autonomous Region which was a key passage on the ancient Silk Road between East and West and also a major thoroughfare for exchanges between the Han and other nationalities of China. Often referred to as 'Little Tibet', Xiahe is famous as the site of one of the six leading Buddhist lamaseries in China, the Labrang Lamasery. The lamasery houses thousands of cultural relics including 60,000 volumes of Tibetan scriptures which have been well preserved. There will also be an opportunity to meet the semi-nomadic herdsmen of the surrounding grasslands. After hotel breakfast, you will be driven back Lanzhou (4 hours drive). In the afternoon, transfer to Lanzhou airport for your flight to next destination.